The results of a three-year and approximately $3.4 million collaborative research project have concluded that it is now possible to integrate additive manufacturing (AM) process chains into automotive series production. Between 1 June 2015 to 31 May 2018, the partners of the AutoAdd project explored the potential of integrating laser powder bed fusion (LPBF) into automotive series production environments in order to create a hybrid process chain that reduces unit costs. The project was coordinated by Daimler and was one of 14 projects being carried out within the framework of The German Federal Ministry of Education and Research (BMBF) funding initiative ‘Photonic Process Chains’, which aims to develop flexible, hybrid manufacturing conceptual designs that can be used by industry to produce individualised and complex products more efficiently than previously possible. Within the project Daimler worked alongside commercial firms BMW, laser manufacturer Trumpf, GKN Sinter Metals Engineering, and AM software developer Netfabb, as well as research institutes Fraunhofer ILT and the Karlsruhe Institute of Technology (KIT). BMW and Daimler defined the requirements for the additive process chain, which Trumpf and Fraunhofer ILT then used to develop various LPBF plant and finishing conceptual designs. The two partners succeeded in producing potentially production-ready optical designs as well as a modular system architecture that enables the use of multiple beam sources and an interchangeable cylinder principle. KIT engineers evaluated the produced factory designs, and using a simulation model visualised an exemplary, conventional process chain. The project team also developed promising automatable post-processing concepts – including the removal of support structures – and analysed novel scalable materials produced by GKN. The AutoAdd project has also led to the development of common metrics for evaluating LPBF manufacturing equipment, and identified them for the most popular equipment manufacturers as part of a large-scale benchmarking exercise. Using standardised benchmark jobs with different test specimens, industrial users can now therefore calculate transferable key figures with which they will be able to find the most economical additive system for their intended purpose. Lastly, the project partners also succeeded in demonstrating and evaluating the reproducibility of the mechanical properties of additively manufactured parts – an essential requirement should additive manufacturing technology be made ready for series production – in several state-of-the-art facilities. Integrating an economic additive process chain into automotive mass production can now be considered possible after the end of the project, according to the partners. BMW has already taken steps towards this, demonstrating earlier this year at AKL that it has succeeded in incorporating a batch-produced additively manufactured component into its series-produced i8 Roadster vehicle. The knowledge gained throughout the AutoAdd project can be used for future lectures. Moreover, in 2019 there will be another project, partly based on the results of AutoAdd, that will deal with the line-integration of additive manufacturing processes to implement the designed additive process chain. GE Additive and GE Aviation have made their own progress toward using additive manufacturing as a tool for series production. The firms announced recently that the Federal Aviation Administration (FAA) has given ‘change in design’ approval to replace a conventionally manufactured power door opening system (PDOS) bracket, used on GE Aviation’s GEnx-2B commercial airline engines that power the Boeing 747-8, with an additively manufactured bracket. The new additively manufactured brackets entered mass production at GE Aviation’s facility in Auburn, Alabama in November using GE Additive’s subsidiary Concept Laser’s M2 Cusing Multilaser machines. GE Aviation anticipates that the first GEnx engines installed with the new brackets will be shipped in January 2019. GE Additive has also announced that its first Concept Laser M Line Factory systems will be commercially available in Q2 2019. The M Line Factory is designed to be an industrial-scale automated 3D production system that comprises a laser metal printer and a material handling station placed side by side – the M Line Factory Laser Processing Station and M Line Factory Material Handling Station respectively. An automated vehicle is used to load metal powder into the 500 x 500mm build platform of the laser metal printer, which then uses 4x400W/1kW fibre lasers to print components. 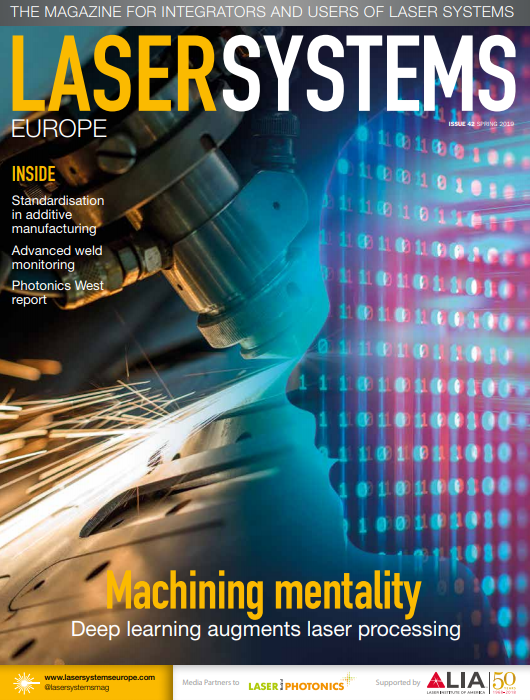 Since GE Additive’s acquisition of Concept Laser in December 2016, the M Line Factory’s design architecture, system and software have undergone extensive review and redesign in line with established GE processes and beta testing with selected customers. The system forms part of GE Additive’s focus to provide additive machines that are reliable, repeatable and ready for series production.